Orson Welles broadcast his radio play of H. G. Wells’s The War of the Worlds, causing anxiety in some of the audience in the United States on 30 October 1938. 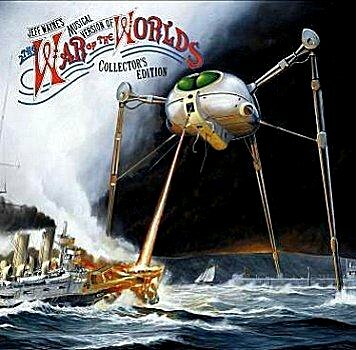 The War of the Worlds is an episode of the American radio drama anthology series The Mercury Theatre on the Air. It was performed as a Halloween episode of the series and aired over the Columbia Broadcasting System radio network. Directed and narrated by actor and future filmmaker Orson Welles, the episode was an adaptation of H. G. Wells’s novel The War of the Worlds (1898).The first two thirds of the 60-minute broadcast were presented as a series of simulatednews bulletins, which suggested to many listeners that an actual alien invasion byMartians was currently in progress. Compounding the issue was the fact that theMercury Theatre on the Air was a sustaining show (it ran without commercial breaks), adding to the program’s realism. Although there were sensationalist accounts in the press about a supposed panic in response to the broadcast, the precise extent of listener response has been debated.In the days following the adaptation, however, there was widespread outrage and panic by certain listeners, who had believed the events described in the program were real.The program’s news-bulletin format was described as cruelly deceptive by some newspapers and public figures, leading to an outcry against the perpetrators of the broadcast. Despite these complaints—or perhaps in part because of them—the episode secured Welles’ fame as a dramatist. The program, broadcast from the 20th floor at 485 Madison Avenue in New York City, starts with an introduction from the novel, describing the intentions of the aliens and noting that the adaptation is set in 1939, a year ahead of the actual broadcast date.The program continues with a weather report and an ordinary dance band remote featuring “Ramon Raquello and His Orchestra” (actually the CBS orchestra under the direction of Bernard Herrmann) that is interrupted by news flashes about strange explosions on Mars. Welles makes his first appearance as the (fictional) famous astronomer and Princeton professor Richard Pierson, who dismisses speculation about life on Mars.The news grows more frequent and increasingly ominous as a cylindrical meteorite lands in Grover’s Mill, New Jersey. A crowd gathers at the site. Reporter Carl Phillips (Readick) relates the events. The meteorite unscrews, revealing itself as a rocket machine. Onlookers catch a glimpse of a tentacled, pulsating, barely mobile Martian inside before it incinerates the crowd with Heat-Rays. Phillips’s shouts about incoming flames are cut off in mid-sentence. (Later surveys indicate that many listeners heard only this portion of the show before contacting neighbors or family to inquire about the broadcast. Many contacted others in turn, leading to rumors and confusion. )Regular programming breaks down as the studio struggles with casualty updates, firefighting developments and the like. ‘A shaken Pierson speculates about Martian technology. The New Jersey state militia declares martial law and attacks the cylinder; a message from their field headquarters lectures about the overwhelming force of properly equipped infantry and the helplessness of the Martians in Earth’s gravity until a Tripod alien fighting machine rears up from the pit.The Martians obliterate the militia, and the studio returns, now describing the Martians as an invading army. Emergency response bulletins give way to damage reports and evacuation instructions as millions of refugees clog the roads. Three Martian tripods from the cylinder destroy power stations and uproot bridges and railroads, reinforced by three others from a second cylinder as gas explosions continue. An unnamed Secretary of the Interior (Kenny Delmar) advises the nation. (The secretary was originally intended to be a portrayal of Franklin D. Roosevelt, then President, but CBS insisted this detail, among others, be changed. Welles directed Delmar to nonetheless imitate Roosevelt’s voice. )A live connection is established to a field artillery battery. Its gun crew reports damaging one machine and a release of black smoke/poison gas before fading into the sound of coughing. The lead plane of a wing of bombers broadcasts its approach and remains on the air as their engines are burned by the Heat-Ray and the plane dives on the invaders. Radio operators go active and fall silent, most right after reporting the approach of the black smoke. The bombers destroyed one machine, but cylinders are falling all across the country.This section ends famously: A news reporter, broadcasting from atop the CBS building, describes the Martian invasion of New York City – “five great machines” wading across the Hudson River, poison smoke drifting over the city, people running and diving into the East River “like rats”, others “falling like flies” – until he, too, succumbs to the poison gas. Finally, a despairing ham radio operator is heard calling, “2X2L calling CQ. Isn’t there anyone on the air? Isn’t there anyone on the air? Isn’t there… anyone?